Apple has purchased SensoMotoric Instruments, a German technology company that specializes in eye-tracking glasses. This is the latest sign that the tech giant is developing its own set of augmented reality glasses. At its developer conference WWDC earlier in the year, Apple showcased some exciting developments in augmented reality using the iPad, but the idea of getting a pair of AR glasses from Apple is an exciting proposition. Apple has a tendency to purchase companies using shell companies so that the acquisition goes under the radar, but with this specific sale MacRumors spotted that the paperwork on the acquisition of SensoMotoric had been signed by Apple’s vice president of corporate law, Gene Levoff. SensoMotoric already has a working model for glasses that can be used for eye-tracking for athletes, as well as having worked with the Oculus Rift team on eye-tracking for their VR headset. 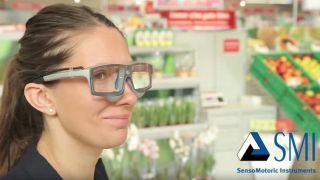 Eye-tracking technology could be revolutionary when it comes to AR glasses, as the ability to select from menus based entirely on where you are looking would make the process much more intuitive and easy, the hallmarks of Apple products. The video below demonstrates that seeing where a wearer is looking while playing a sport can improve their game. Essentially, you can tell if someone has got their eye on the ball. Apple has not released any statements regarding the reason for this purchase or what it intends to do with the technology but we will let you know as soon as we know any more.